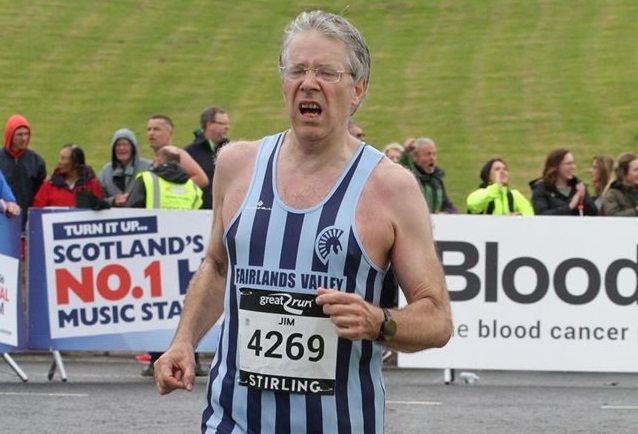 On a visit back to Stirling where he worked before coming to Stevenage Jim Brown ran the inaugural Stirling Scottish Marathon in a Good For Age qualifying and season’s best time of 3 hours 46 minutes 32 seconds. He was ninth in his category and 862nd out of about 4,300 finishers. Roger Biggs finished in 5:13:48. The course was beautiful, starting in Blairdrummond Safari Park, passing the Wallace Monument and finishing below Stirling Castle. Despite some drizzle conditions were almost perfect for runners. A team of Spartans will be at next week’s Edinburgh Marathon. TIM SABAN ran the Chester Half in a new personal best (PB) of 1:31:39. There was a tough course for Wimpole Hoohah but JOHN HARRIS was second man 50 plus in 43:04. And JENNY GARRETT ran the Portchester 10K, near Portsmouth, in 54:02. David Bowker went to Battersea Park on Tuesday for the monthly Veterans’ Athletic Club five miles race walk league. He finished fourth overall and second man in a recent personal best of 50 minutes 11 seconds. Stevenage parkrun saw its second largest ever field on Saturday and MIKE GREEN was the leading Spartan, finishing 9th in 19mins 11secs. BRIAN WHITE was 11th in 19:36 and NICK GILL 27th in 21:13, both achieving new course PBs. GARETH COWELL just missed a top 30 slot in 21:31 but notched a new course PB too. The other Spartan men were MARTIN DUDLEY (22:29), PAUL MAGUIRE (22:48, new course PB), MARK BEASLEY (23:24), DARREN EMMERSON (23:26), TIM ROBINSON (25:29), KARTIK SHARMA (25:57), ROBERT EVANS (26:56), SELVAN NAICKER (31:37) and DAVE PEACH (36:30 on his parkrun debut). For the women, there was a fantastic course PB for HAZEL SMITH who followed up her recent 10k PB in the midweek league by smashing more than a minute and a half off her previous best here. She finished 6th woman in 23:26. NIKKI WILBY was 13th in 24:56, CAROL PAUL 22nd in 26:24 and CALLIE CHAPMAN 28th in 27:02. KAREN PALMER (28:31) and SALLY PHILLIPS (30:42, a new course PB) were the other Spartan women. In the other local parkruns, ANDY JAY ran at Panshanger finishing in 25:20, while VERITY FISHER was 15th woman at Ellenbrook Fields in 24:44, a new course PB. Heading in to Essex, JOHN ROXBOROUGH finished in 23:24 at Hatfield Forest, and BARRY OSBORNE was 8th at Great Notley in 21:45. Finally, DANIEL SUTTON finished in 25:37 at Coventry, and HAYLEY BIRONNEAU crossed the line in 26:38 at Poole parkrun. Something completely different. On Sunday JENNY PAUL the PARAS 10 with her dog. She finished in 1 hour 52 minutes 28 seconds. A bit slower than a normal ten mile race due to obstacles, wees etc. (dog, not Jenny) lots of water stops for dog as it was very hot. A fun course across the army training ground at Colchester barracks including swamp, water (swimming for dog) and plenty of mud. The Red Devils flew in at the start, gunfire around the course. She says it was a fab race. Second Mid Week Road Race League in Stevenage on Wednesday 24th May.